Tennyson O’Donnell, Director of Trinity’s Writing Center, asked several of us to join him this semester on ways to address plagiarism with “less policing and more pedagogy.” This seemed like a good opportunity to improve on my Avoiding Plagiarism learning exercise, which currently appears on the WordPress syllabus for my First-Year Seminar and Educ 300 Ed Reform: Past and Present courses. Here’s some ideas to consider, created with the assistance of Ilya Ilyankou ’18. Try the demos further below and ask yourself two questions: Is this a good way to learn? And can other faculty easily customize it for their own courses? 1) Explanation with examples: Currently, the Trinity College Student Handbook offers an explanation of plagiarism, with some examples. But to my knowledge, the only digital format is a PDF file. It’s not easy to point students to the right section. Furthermore, if you don’t like the examples or citation format, it’s not easy for faculty to customize. Recommendation: if Tennyson and other committee members recommend a revision of the Handbook text, which seems likely, then please make the new version more easily accessible online, with a direct link, and also in formats other than PDF (such as HTML or plain text). 2) Contextual example: Briefly, one page of a sample paper that includes examples of plagiarism and proper paraphrasing, with instructor’s comments on the side. See open-source code on GitHub: https://github.com/Action-Lab/avoid-plagiarism-tooltip Click to open the index.html file. Faculty can make a copy and insert their own examples, or more likely, ask an instructional technologist to do it for them. This version has no grading component. Basically, this version updates my existing exercise from a relatively static WordPress page into a slightly more interactive Google Form. Any faculty member with a basic knowledge of Google Drive (or an instructional technologist) can make a copy to customize for their own course. The Google Form enables manual grading: instructors can click on “Responses > Individual” to review each student’s answers. In fact, I have set up this demo form so that anyone can click this link to see the instructor’s view. Alternative Moodle version: I don’t know the details, but it may be possible for Trinity’s instructional technologists to translate this form into a Moodle component, which faculty could request to add to any Moodle course. Potential advantages might be the ability to connect scores to the Moodle gradebook, or perhaps the ability to insert feedback on students’ responses. But a Moodle version of this form would require Trinity to create an “open” Moodle demo site where faculty can see and test modules before deciding whether to add (or request IT to add them) to their Moodle courses. 5) Interactive multiple choice quiz: I didn’t create a demo, but you can easily imagine different versions of multiple-choice quizzes on avoiding plagiarism. Both Google Forms and Moodle (and many other platforms) support quizzes. If you like this concept, then design some thoughtful questions and add adaptive responses, so that incorrect guesses show hints toward the correct answer. And share the demo link to your quiz, as well as the underlying text and answers, so that other faculty (or instructional technologists) can customize for other courses. Now consider some of the indirect costs, which I can only estimate, because no one has shared actual data. The Trinity edX Committee Report of 2015-16 stated that “faculty and staff involved in creating new edX courses made it clear that this process required a substantial investment of time.” First, although faculty like me received an additional stipend of $8,000 to develop and run a Trinity edX course, the actual time commitment cut into our other teaching, research, and service responsibilities. Second, my experience revealed that IT staff had to spend a considerable amount of their time to co-produce and manage our edX courses. Trinity employs 3 instructional technologists and one director to manage them. (Did anyone tabulate the total number of hours spent by instructional technologists per edX course? Might it have exceeded 33 percent of their annual workload, or more? If yes, then add 1 FTE instructional technologist salary and benefits to the direct cost estimate above.) Given that only 4 or so faculty developed an edX course each year, this project swallowed up a disproportionate amount of their workload, and there may be hidden detrimental costs to the other 180+ Trinity faculty who did not develop edX courses, but would have benefitted from IT services. Update on Nov 29th: Also, note that of the 6 Trinity faculty who developed edX courses that appear online to date, 3 are now retired (Archer, dePhillips, Morelli) and the other 3 of us are full professors (Lloyd, Myers, and me). This suggests that Trinity edX does not match the needs of the majority of our younger faculty. The Educational Studies Program at Trinity College welcomes Jia-Hui Stefanie Wong as a two-year visiting faculty member, beginning in Fall 2017. Professor Wong is completing a joint Ph.D. degree in the Department of Educational Policy Studies and the Department of Curriculum and Instruction at the University of Wisconsin-Madison. Her dissertation, “White Dominance in Diverse Schools: When Multiculturalism and Social Justice Aren’t Enough,” is based on a 16-month ethnographic study of how students and teachers perceive and challenge inequalities at a racially and socioeconomically diverse high school. Despite the school’s commitment to social justice, her study examines how White supremacy and privilege persist within its power structures. She also co-authored an article on the racialization of Asian American immigrant students in Educational Studies. Drawing on her teaching experience at UW-Madison, Professor Wong will offer courses at Trinity such as Educ 200: Analyzing Schools (fall and spring), Educ 320: Anthropology and Education (fall 2017), and Educ 309: Race, Class, and Ed Policy (spring 2018). Community Solutions in Hartford is searching for a summer intern to conduct oral history interviews with Northeast Hartford residents and former employees of the Swift Factory for their Inspiring Places project. Read more in this October 2015 Hartford Courant article. See internship posting in the PDF below and contact them directly for any questions. Come work with us at Trinity College in Hartford, Connecticut. We’re searching for an Associate Director of the Community Learning Initiative, a full-time position with an initial three-year contract. While other colleges call this “service learning,” at Trinity we emphasize creating knowledge in collaboration with Hartford community members. The right person will bring teaching, administrative, and urban partnership experience to help us support and expand community learning between our campus and the capital city. Also, the candidate will teach one course in our new Community Action Gateway for entering students, either CACT 101 Envisioning Social Change or CACT 102 Building Knowledge for Social Change. These courses emphasize interviewing and hands-on research with community stakeholders, designing collaborative social action projects, and sharing work though public speaking and digital storytelling. • In collaboration with the faculty director, guide the Community Learning Initiative to promote academic engagement with Hartford, by matching new/existing faculty with community organizations, and strengthening and publicizing these partnerships. • Build relationships with Hartford organizations. • With support of the faculty director, oversee the Community Action gateway for entering students, including teaching one course per year, planning with participating faculty, and recruiting through Admissions. • Support the CLI Research Fellows Program. • Coordinate with the Office of Community Service and Civic Engagement. The Associate Director of the Community Learning Initiative is a 12 month full-time administrative position with competitive salary and benefits that reports to the Faculty Director of CLI. The initial contract is for three years, with a flexible start date, to ideally begin no later than March 1, 2017. Review of applications will begin immediately, and will continue until the position is filled. The successful candidate will contribute to Trinity’s urban academic programs and will show clear evidence of leadership skills and experience with urban community partnerships,, excellent oral and written communication skills, ability to collaborate with faculty colleagues, experience directing and mentoring students, and evidence of innovative teaching. A complete application consists of a letter of application, curriculum vita, and names and contact information for three references. Please submit all application material at https://trincoll.peopleadmin.com/. Qualifications: A master’s degree is required and a doctoral degree is preferred. Significant community engagement and college-level teaching experience is expected. Salary is commensurate with education and work experience. At Trinity, we define the Community Learning Initiative (CLI) as a form of experiential education, which matches our liberal arts courses with local organizations in the City of Hartford. Since 1994, CLI courses have been offered in almost all of our academic departments and programs, connecting with more than 250 community organizations, and enrolling about half of our undergraduate students. See the online course schedule and select “community learning” in the drop-down menu to view the range of participating courses for next academic year. CLI highlights some of Trinity’s most creative teaching and learning, sometimes in unexpected places. 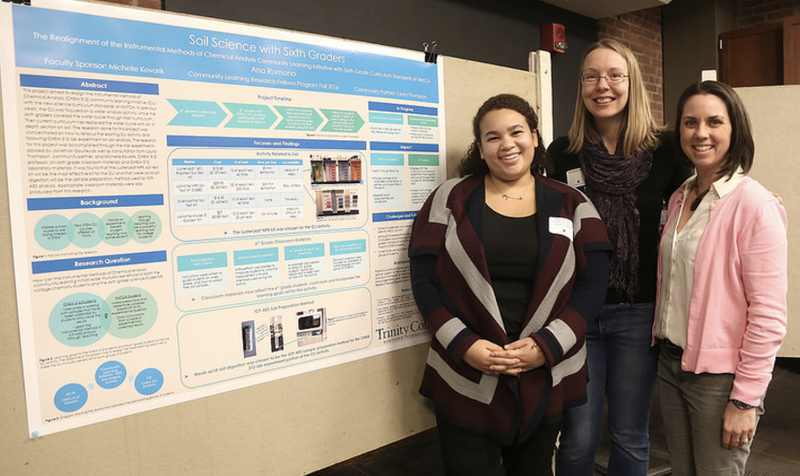 Chemistry students have analyzed toxic metals in soil samples from abandoned city lots to help housing organizations plan where to build. Members of the Hispanic Hartford course write bilingual web essays that feature the city’s rich Latino cultural resources and agencies for newcomers. Theater and Dance students have partnered with nearby elementary school students, and women who were released from prison, to help choreograph and tell their stories in public performances. 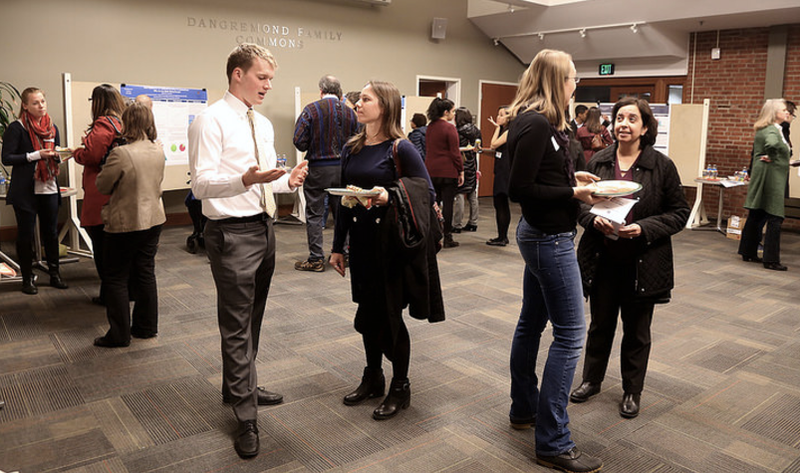 Advanced undergraduates apply to become CLI Research Fellows, where they receive additional training and support to make their independent studies and senior thesis projects more meaningful and useful to their community partners. 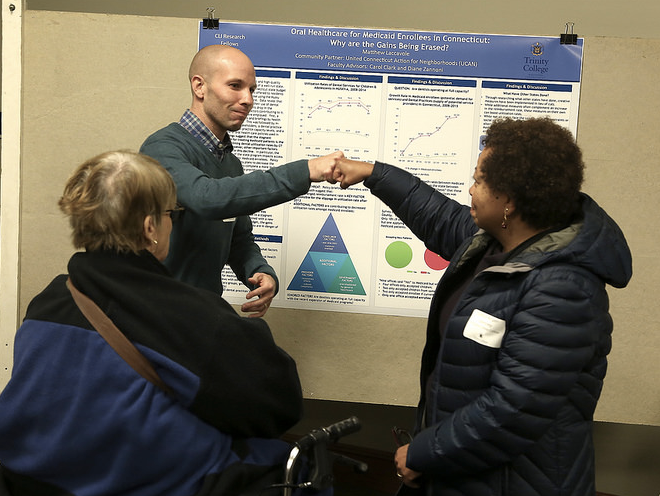 (See Dec 2016 news story on the fellows’ community research poster presentation.) While other colleges may label this “service learning,” Trinity philosophy professor Dan Lloyd explains in this essay how “community learning” better defines the two-way collaborative relationship that brings together the campus and the city. How do different community organizations (neighborhood groups, non-profit advocates, unions, government agencies, social entrepreneurs, philanthropies, etc.) envision social change? 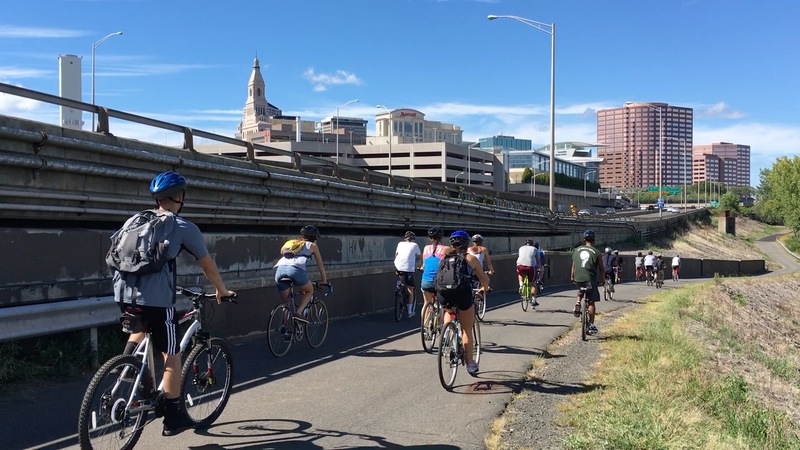 What strategies for change do we find across the City of Hartford? How can Trinity students cultivate and engage in meaningful partnerships to promote social change? Students will investigate these and related questions through readings on community action and social impact, hands-on research and interviews with community stakeholders in Hartford, and the design of collaborative social action projects around a core theme (to be implemented in the spring semester). Students will think critically and reflexively about the root causes of social problems, the ways that power and privilege shape social change work, and how their biographies shape their understanding of and engagement with Hartford. How can students and community groups effectively collaborate to develop goals and outcomes for social action projects? How can knowledge be defined and constructed collaboratively with community partners for purposes of social change? In this course, students work in collaboration with community groups to implement a project in the City of Hartford. Students learn strategies for effectively engaging with community partners and explore and reflect upon the process of producing and disseminating knowledge for social impact. Students will expand their skills through workshops on non-fiction narrative, public speaking, digital storytelling, and data visualization, facilitated by leading experts in these fields. Student groups and their community partners will share their stories about their social change projects at the end of the semester. The intellectual energy of CLI attracted me to come to Trinity years ago, and the continued dedication of faculty, students, and community partners still inspires me today. The CLI brainstorming lunches offer one of the few opportunities on campus to discuss teaching and learning across departments. 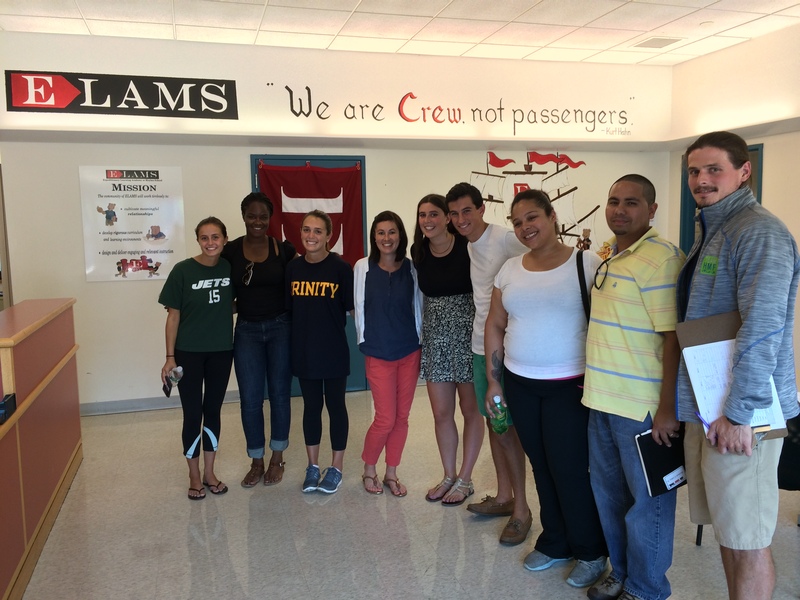 My faculty colleagues have integrated community learning into several of our courses in the Ed Studies Program. 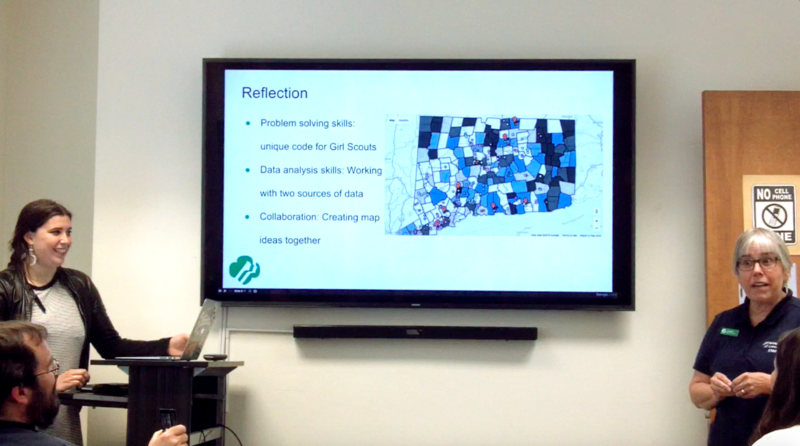 Last year I discovered new ways to connect students and city non-profit organizations through the data visualization internship seminar at Trinfo Cafe, Trinity’s neighborhood internet and community center. I look forward to working with the right candidate, who will bring new ideas and energy to expand the academic relationships between our campus and the city. Thanks to Brian Croxall, Digital Humanities Librarian at Brown University, for inviting Matt Delmont (Arizona State University), Esther Cyna (with Ansley Erickson at Teachers College, Columbia University), and me to present work from our digital book projects on November 4th, 2016. See notes and links on our public Google Doc, my presentation slides, plus this video recording of our session. Abstract: This panel contrasts how historians of race and education are authoring three digital books on the web, which raises provocative questions about the future of scholarly communication. Historian Matthew Delmont created open-access companion websites to accompany both of his recent books published by the University of California Press: The Nicest Kids in Town (http://NicestKids.com/) and Why Busing Failed (http://WhyBusingFailed.com). 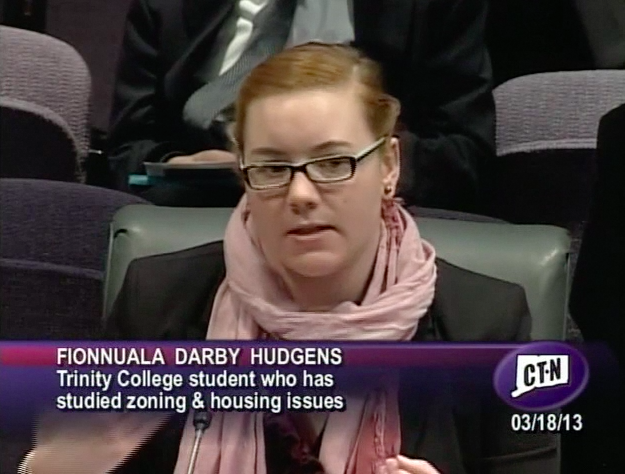 Jack Dougherty and his contributors are creating On The Line: How Schooling, Housing, and Civil Rights Shaped Hartford and its Suburbs, a digital-first, open-access book with interactive maps and oral history videos, under contract with Amherst College Press (http://OnTheLine.trincoll.edu). Ansley Erickson and Esther Cyna and their colleagues are producing Educating Harlem, a digital history project in two interconnected parts that mix elements of traditional publishing with web-based open-access scholarship. Promise Zones are an initiative started by President Obama to give some communities battling poverty a leg up in making lasting change. In 2015, North Hartford became one of only 22 promise zones to be named in the entire country. As we begin our second year with the North Hartford Promise Zone designation we would like to share information regarding the exciting North Hartford Promise Zone AmeriCorps VISTA service opportunities that are available. Currently, the North Hartford Promise Zone is seeking candidates who are interested in serving as North Hartford Promise Zone AmeriCorps VISTA members. As part of the Promise Zones initiative, AmeriCorps VISTA members are available to each Promise Zone community. AmeriCorps VISTA is a national service program designed to alleviate poverty. Members make a year-long, full-time commitment to serve on a specific project at a nonprofit organization or public agency. They focus their efforts to build the organizational, administrative, and financial capacity of organizations that fight illiteracy, improve health services, foster economic development, and otherwise assist low-income communities. We are looking for people who are passionate about the promise zone community, organized, and who have good writing and computer skills. Please feel free to post, share and email the opportunities with networks and others.